I haven't done much with Hudsons for the last 4 years but I've decided to fix up a 51 Pacemaker 2dr Sedan I've had sitting indoors for about 17 years. It has 52,000 miles on it and seems to be in pretty good shape. It looks to me like it has a leaky rear main seal, judging by all the sludge and oil in that area, even after all these years that it has sat. The engine is still in the car and I pulled the oil pan today to get a look at the rear main seal area. It does look like it has been leaking. I have heard of the neoprene rear main seals and am wondering if that is the way to go , rather than the rope seal. I don't consider myself to be an engine mechanic by any stretch of the imagination, but I'm hoping that with guidance I could install the seal successfully. I'm hoping someone will see this post and give me suggestions and maybe point me to other people who also knows about them. I am also thinking I will probably pull the engine and transmission as a unit. I'm pretty sure the cork clutch is stuck to either the flywheel or pressure plate and will have to be dealt with. I think this car has a lot of issues that will need to be sorted out before it is drive-able. I imagine I will be posting a lot of questions here as time goes on. Thanks for any help you can give me. I recently installed the new seal from Dale in a 308 which is being run on the beach in Wildwood NJ and other places by T.R.O.G. 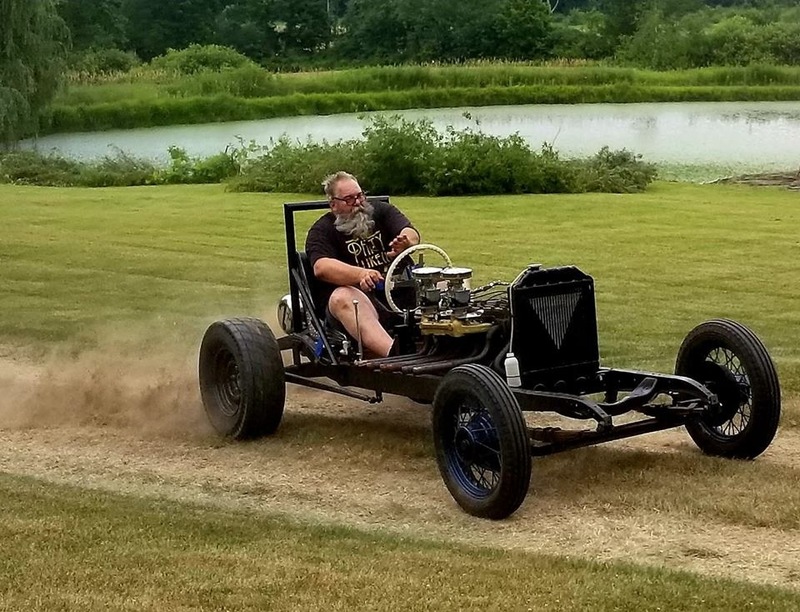 Barnstormer 'Crazyuncleharry' Works great. Thanks Uncle Josh. That looks like a blast! Can you tell me how to install the Seal? Does the crankshaft have to be removed? Maybe the seal just drops into place? Does it come with instructions? I know a lot of dumb questions probably. It is very difficult to get a Rope Seal doig it In Chassis but it can be gone because I did it and doesnt leak (yet). Ive installed Heoprene rear eals in a few Hudson motors when rebuilding with no problem but the last one dripped so went back to a Rope Seal, Actually, New Rope Seals are not made of the same materials as the old originals and may leak prematurely too (Thanks to E.P.A. Regs). Doing In Chassis the Neopreme Seal is far easier but it may drip eventually, but maybe not. Thanks for your input Ol racer. You gave me a lot of good information. It sounds like you are saying that the old rope seals were the least likely to leak but the new ones are made of different material and might leak. You are also saying that you have had the Neoprene seals leak. It makes it hard to know what to do. I do plan to change the seal with the engine out of the car and on an engine stand, with the bottom of the engine facing upwards, if that makes any difference. Ken makes an Excellent read for you. As long as the motor is out and the crank isnt reground a Rope seal is your best choice. Yes, unfortionately Ive read newer Rope seals are not made of the old quality materials because of EPA squashed it. As long as the motor is out installing a rope seal is easy. I would pack it in then put a dab of Blk RTV in the ends. Suggest look online for install videos on Rope Seals. Some say soak in oil while other say not. One thing I do after 'packing in place', trimming, and applying Blk RTV is I rotate the seal slightly (+/- 1/4") so the gaps are not at the block & Cap part line (the seal sticks out of cap slightly on one side of cap & out slightly on opposite side of block). Walt Mordenti also discusses on page 11 of his book, "Walt's Garage Hudson Tech Tips Volume 2: 2004 - 2007" the proper method for replacing real main seals on Hudson engines. His final comment regarding this seal replacement is, "There is no short cut for any of these jobs, and don't let anyone tell you different." Thanks Ken for your very informative write up; a ton of useful information and quite detailed and useful. I will use it as my guide to getting this done. Thanks again Ol racer. Thanks for your tip railnight. I do have Walts' Books, I just haven't read them thorough enough to know whats in them. 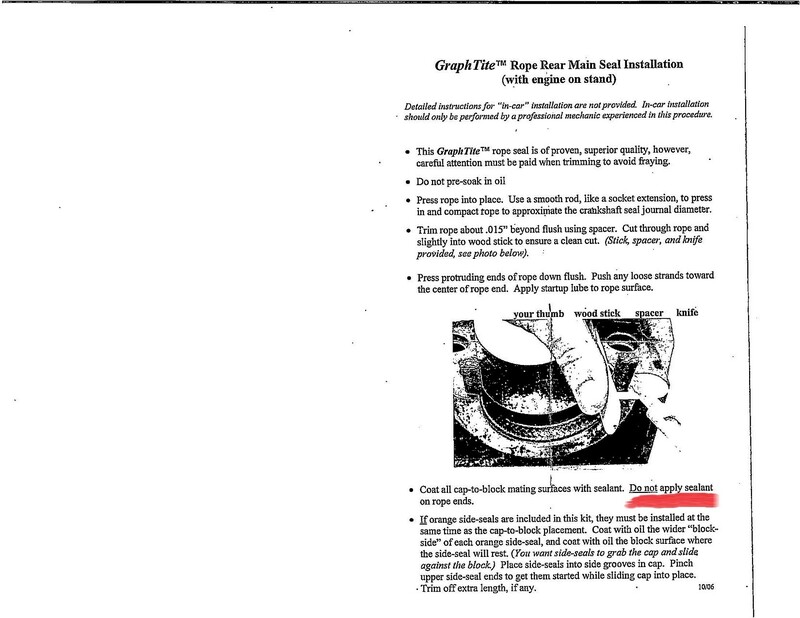 I got to looking through some of my old gaskets and I found an info sheet about installing the rope seals. It is titled "GraphTite Rope Rear Main Seal Installation (with engine on stand)" I wondered what the GraphTite trade mark meant and I found online that it is a trademark of the Best Gaskets company. I see that this document is dated 10/06 so I'm not sure if it is still relevant. In the document they say do not apply sealant on rope ends. Can you comment on why they say this? I don't know if I should do it or not , or if it makes any difference. I will send a scanned copy of the instructions with this post. I sent an email to Best Gasket asking why they recommend to not apply sealant to the ends of the rope seal. This is the reply I got back. We do not recommend sealant on the ends or our GraphTite rope because the sealant will harden and actually damage the rope causing a potential leak passage. Other people might recommend sealant on the ends of the old style asbestos rope., not sure though.